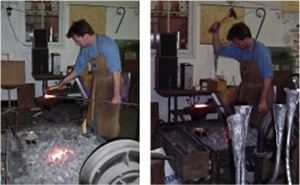 Peter Scheltus has been a blacksmith since the early '90s. He gives blacksmithing workshops through the year. A course for beginners in blacksmithing is also nice for fathers and kids (minimum age: 7). This course is meant to give you an idea of what is possible with steel. You will be working on a small, nice assignment that you can take home at the end of the day. The day starts at 10:00 and ends around 17:00. Tea breaks in between and at 13:00 Bogata Suma will serve an organic lunch from the garden. All materials will be provided, except old working clothes (jeans & shirt) and strong, sparkle proof footwear.